I am usually critical and occasionally grumpy when visiting a restaurant. I am hard to please, as I have had my fair share of good meals in my culinary career. But then, suddenly you accidentally find a place out of the ordinary. This means the awakening to new flavours as I did at L’eveil des sens in Strasbourg. This was a place that offered that extra refinement lifting our experience from the good to the extraordinary. This was delicious, delicate, delirious, delightful dining!!! 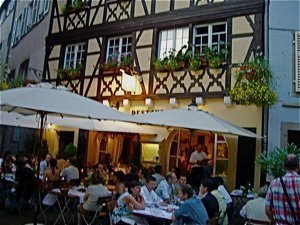 Located by the canals in La Petit-France, one of the most beautiful historic areas in Strasbourg, you may hardly find a more romantic and beautiful location for a restaurant. 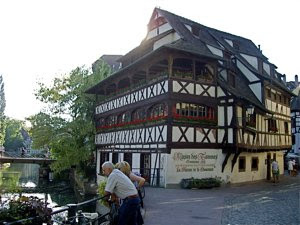 Just by you find the historic building Maison des Tanneurs built in 1572, housing a traditional Alsatian restaurant, and around there are beautiful half timbered houses along narrow ancient streets or along the canals that criss cross the area. 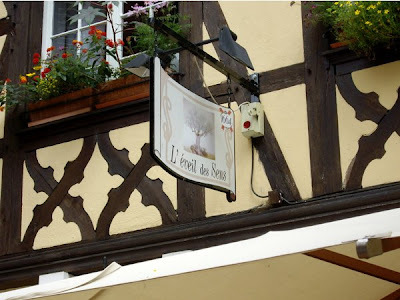 L’éveil des Sens is located in one of these ancient beautiful houses and you may sit outside or inside. Either choice is the ultimate location. A perfect spot for that romantic dinner, or to celebrate old friendship as we did. L’éveil des Sens had invested in interior and style to enhance its beautiful location. We decided to sit outside to digest the beautiful architectural room along with the food, but the interior matched the exterior – equally beautiful. Outside was decorated with flowers and the tables were beautifully set for a delicious dinner. There could have been a little more space available, but these are mere details my friends, and not to spoil the experience. Excellent service! We were well taken care of. The delicious food was brought out without much delay and to relieve our hunger, they served small dishes neither asked for, nor paid for. Good advice on what wine to choose, even though I had a wine expert available on the other side of the table. Øivind, my friend and former colleague confided that he had taken a one-year wine course. EUR 150 for two is a pretty steep price, but considering the location, service, food, wine, and the little extras it ended up as highly recommendable even at this price. I called them the teasers or amuse bouche, as these small delicacies are called, amusement for the mouth. The fact that we were served these two small dishes deserves the full bargain rating. Small shot glasses served before we started, a tomato and a melon shot, delicious and neutral, maybe a little too neutral. After our meal we were served two mini desserts, one shot with caramel. What a generous idea. This was a great feast, closer to perfection than most I have eaten lately. A thick generous slice of the most succulent, creamy duck liver, served in a most original culinary setting. I think that there was a theme that the cook had toyed with. The ducks are fed corn, there was a shot based on corn, and one piece of popcorn in a sugar flake. Neat! I found the popcorn more as a decorative element, but I took a bite, but the shot tasted delicious. The duck liver was as always – beyond words. Both duck and goose liver has this incredibly sweet aroma, and an exquisite creamy consistency. 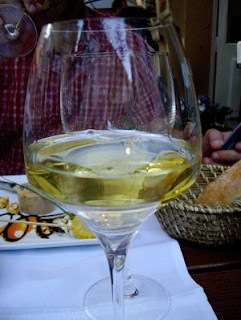 Do enjoy it with a glass of Sauternes or Gewurztraminer Vendages Tardives, as I discovered that Alsace produce an equally superior wine as the ones from Bordeaux. The sweetness of the wine and the duck liver melt into a spiritual ecstatic experience in taste heaven. 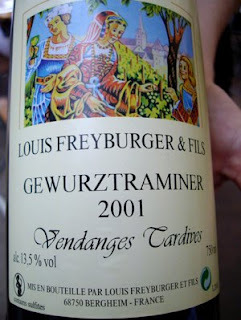 At L'éveil des Sens I tasted a Louis Freyburger & Fils Gewurztraminer 2001 Vendange Tardive - a wine to die for. The name - late harvest, refers to the fact that the wine is made from grapes that are allowed to hang so long that they start to dehydrate, thus concentrating the sugar. The Gewurztraminer had aromas of tropical fruits, peaches, and honey, and in spite of all the flavours, being fresh and so easy to drink. 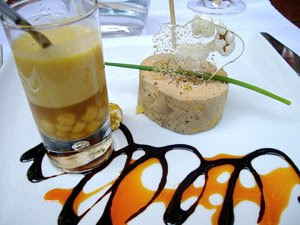 The wine created the same culinary union with the duck liver as a good sauternes would. I love beef in two forms. Either prepared red to medium when serving a fillet or an entrecôte, or simmered for a long time in either red wine or beer. This way to prepare meat requires tougher meat of lower quality, i.e. from other parts of the animal. Whereas the fillet is lean, this meat has more fat, but ends up equally tender in a stew as a prime cut of beef. 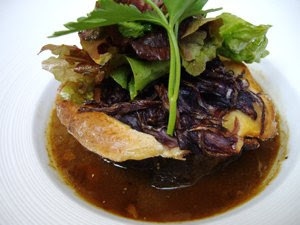 At L'éveil des Sens they offered beef braised in Geuze, a strong often sweet Belgian beer. The beef was cooked to perfection, tender, having been simmered gently for a longer period. It was served with a brioche, a thin slice of fine bread, fried onion, and crunchy salad leaves. Good texture, rich and well balanced taste. This was absolutely perfect. I was lucky to have Øivind to choose wine. He chose a Madiran wine from South West France. He highly recommended these wines as a good alternative to Spanish wines. 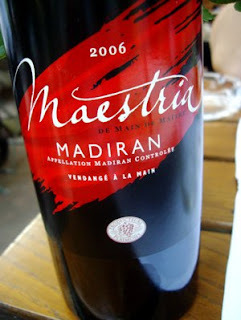 The Maestria 2006 was absolutely perfect. It is a blend of tannat, cabernet sauvignon and cabernet franc grapes. It had a brilliant ruby colour, a nose of ripe red fruit, flowers and toast. A characteristic fruit mouth, with soft tannins, persistent freshness and a final liquorice-peppermint. It was a great choice to the the beef and the lamb that Øivind ordered. As close to perfection as possible. 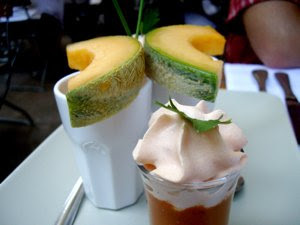 Enjoy Food & Travel recommends L'Eveil des Senses as one of the best eating experiences until now. Chinese food in Lyon? Avoid Le Mandarine! Is my flight on schedule?